From the initial pitch, market research, persona, to the creation of “UGO”brand design, this report will take you through the semester-long journey we went through and a business idea that I am proud of. We picked our brand easy. Nike. The ultimate sportswear brand that just seems to keep winning. How did it happen? Does customization play a role in its success? More importantly, what has it NOT been able to deliver that customers want? In other words, where is the opportunity for a new brand to compete in this already crowded and well-developed space? We started answering the questions from conducting the market research. The three of us are all fans of Nike and luckily we are all into being fit in various degree, which makes the topic even more fun. According to EuroMonitor, the sportswear industry experienced 38% growth from 2010 to 2015, with 74 billion in 2010 and 102 billion in 2015 in the North America district. Nike dominates the market by occupying22% of the market share, which is really impressive, given its solid brand image and having an already very strong line of products. In the big picture, Under Armour appeared itself as an underdog but is experiencing success. Their target audience is with a younger crowd, providing an exciting alternative for people who are more adventurous to try new and relatively cheaper but still quality products. They also made several good calls on building up their brand image by signing popular spots star, one notable example being Stephen Curry. After some digging and chewing over the research data, we finally reached our opportunity space and identified the direction our new brand is going to be in. We developed three personas to help us situate our brands and learned about our users. We stepped away from focusing on the "style" but the people and their relationship with fitness. Meet Mike, Thames, Brenda and Sue. However, current brands are all emphasizing on the already motivated crowd and performance optimization. "UGO" is a smart sportswear brand that aims at providing personalized motivation to everyday people. people can rely on and give them the “spark” needed to get started and moving. disrupts the sportswear space by providing products that are not only smart but thoughtfully motivating, by providing complimentary training and adventures to get customers moving. understands the importance of the touch of human and its essential role of generating and maintaining a healthy lifestyle. We think it is important to incorporate an interpersonal aspect by providing in-store fitness counseling for our customer so that they can locate what products they really need and set up a fitness plan with the help our friendly and professional staff. 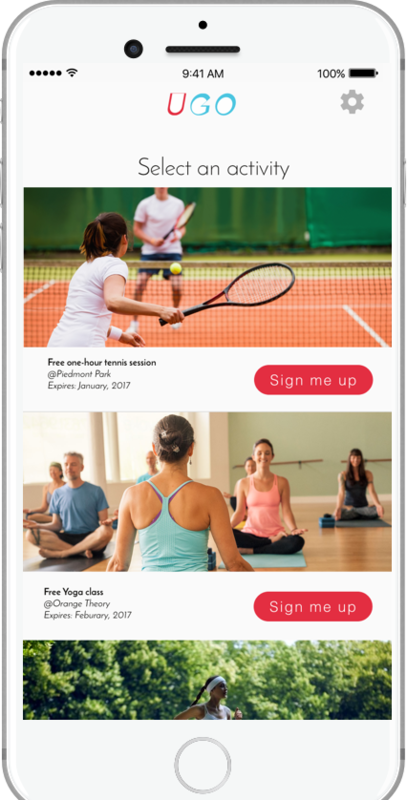 We also wanted to create a social channel that initiates crowd-sourced fitness activities as well as a gamification and reward platform to encourage activities taking place, which will also provide us with more sales and strengthening of our customer base.